So Polako, you saying Norwegians pull more toward the British because the Vikings imported more Britons (women I assume) to Norway than they did to Sweden, or is it simply because Swedes have received more Finnish admixture over the years than Norway has? I identify more with Acadian culture, always have, no "treason" there. Acadians were called Souriquois in the old days by "pure" French, and I am poking fun at how some folks shuffled some papers in Ottawa and I am considered Metis by Canadian law now. Nothing changed. I thought changing race would be like becoming a werewolf or something. Nah. I guess I could claim treaty rights or something, but, I am irresponsible, I will leave that to people who actually know what they're doing. Norwegians are genetically more western than Swedes, for a variety of reasons, because they're a more westerly population, so it's been easier for them to mix with Scandinavia's western neighbors than for Swedes, and that has been true since the earliest relevant time, the Mesolithic. At the same time, Swedes have always been more exposed to gene flow from present-day Finland and even Russia. But certainly the difference between the two populations is not huge, and most of it can be explained by Isolation by Distance rather than any major migrations into the territories of what are now Norway and Sweden. In both cases Swedes are above Norwegians and Latvians are above Lithuanians. Interesting. 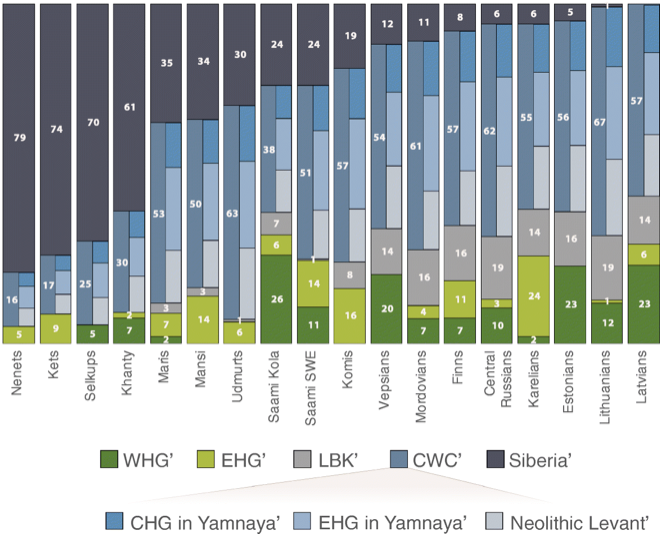 So Lithuanians have the most Yamnaya ancestry then, per Dodecad K12a's north Euro component? In Tambets et al 2018 (Genes reveal traces of common recent demographic history for most of the Uralic-speaking populations) Lithuanians had the most Yamnaya ancestry followed by Udmurts. At the same time, Swedes have always been more exposed to gene flow from present-day Finland and even Russia. The study (Salmel et al. 2011) found that people from Northern and Southern Sweden are genetically different from each other, while the genetic change from south to north is gradual. The frequencies of Haplogroup N generally correspond with the two populations' Finnish ancestry (7% in Sweden; 2.5% in Norway.) The map shows that Sweden has a wider red area in the north, where populations with this Siberian genetic ancestry live. The current population in Northern Ostrobothnia in Northern Sweden is largely derived from a 16th-century migration that originated from the province of Southern Savo in Finland. The northern part of Sweden, Norrland, showed a particularly strong population structure, which could be explained by genetic drift in this sparsely inhabited region. However, this hypothesis was challenged by the genetic diversity within Norrland that was not consistently reduced: in fact, Norrland showed significantly lower IBS similarity than Götaland. This could suggest the presence of several isolates within Norrland, and indeed, signs of such were detected in the MDS and FST analyses. Furthermore, LD in Norrland was stronger than in the rest of Sweden. Together, these patterns of variation could be partly explained by migration. While the influence from Finland seemed moderate, at the most, we unfortunately lacked the reference samples necessary for analyzing possible Sami and Norwegian contributions. However, earlier mitochondrial DNA and Y-chromosomal studies have indicated influence from the Sami and/or Finns in Northern Sweden, as well as decreased genetic diversity , . A pattern of pronounced genetic differences similar to those in Norrland has been previously observed in the northern parts of Finland . However, Eastern Finland showed a different combination of signs of drift: strong LD and low diversity. These probably stem from the major founder event during the 16th century migration wave  that appears to have affected the gene pool more profoundly than subsequent drift within local population isolates. Thus, not all small and drifted populations are alike, and the relevant geographic scale of drift can vary. Interestingly, the Finnish province genetically closest to Norrland was not the neighboring Northern Ostrobothnia, but the Swedish-speaking Ostrobothnia and Southwestern Finland hundreds of kilometers further south. Although this pattern might first seem surprising, it is consistent with the history of Northern Ostrobothnia, where the current population is largely derived from a 16th-century migration that originated from the province of Southern Savo . The arrival of these genetically distinct  eastern migrants may have broken a possible earlier genetic cline along the coasts of Northern Sweden and Western Finland, and despite the later contacts across the border, the following centuries might not have been long enough a time to fully restore the cline. Last edited by ThirdTerm; 2019-02-11 at 22:36. If that's the case, Scandinavian variants of R1a largely found in Norway, probably don't correlate with Baltid phenotypes. However, I believe Slavic variants of R1a largely found in Slavs, and Balts, are found at higher rates I've read in Swedes than in Norwegians. It could also be N1c1 haplogroup, but it seems this is pretty small in much of Sweden, except the North, however. I also believe Polakos South-Baltic component might correlate closely with Baltid phenotypes too, and if so I believe it was also higher in Sweden, than in Norway. Anyways, I don't think genotype, and phenotype have to match, but I do think there might be correlations sometimes. Last edited by Yyy; 2019-02-12 at 02:56. The map was taken from this Mail article explaining the Ancient Fennoscandian paper by Lamnidis et al. (2018). But I don't know how much these popular science writers actually understand genetics. 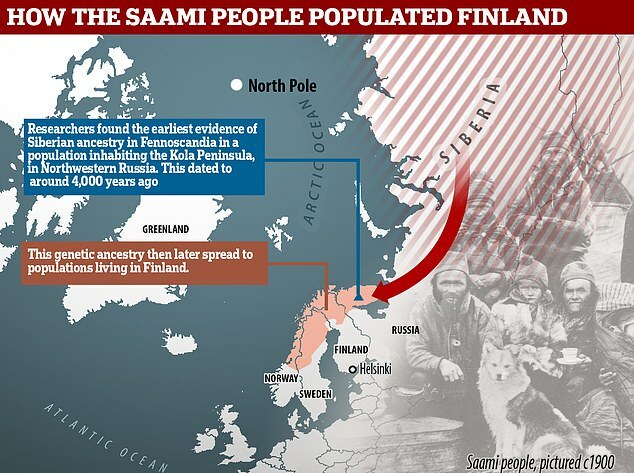 The study also found that people genetically similar to present-day Saami people inhabited areas in much more southern parts of Finland than the Saami today. For the study, genome-wide genetic data from 11 individuals were retrieved. Eight individuals came from the Kola Peninsula, six from a burial dated to 3,500 years ago, and two from an 18th to 19th century Saami cemetery. 'We were surprised to find that the oldest samples studied here had the highest proportion of Siberian ancestry,' said co-author Stephan Schiffels from the Max Planck Institute for the Science of Human History. The other three individuals analysed for the study came from a water burial in Levänluhta, Finland.